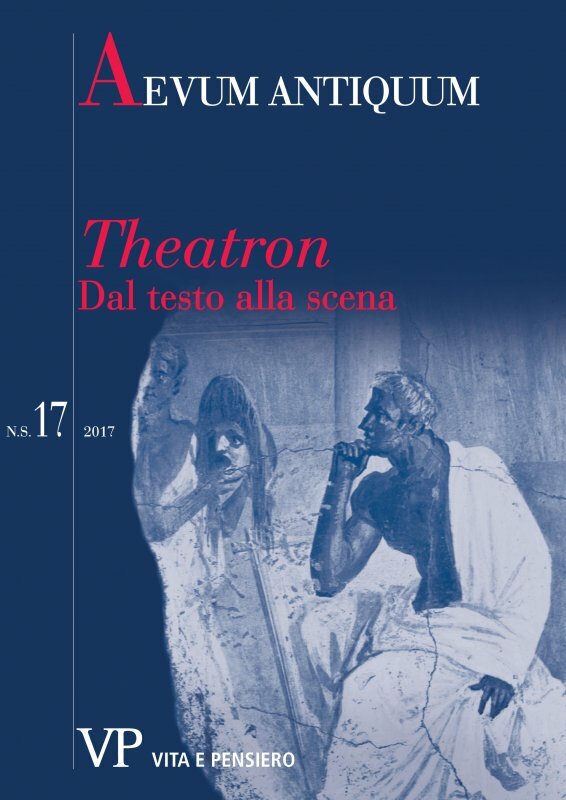 Fondata nel 1988 da Giovanni Tarditi, "Aevum antiquum" è una rivista di filologia classica. Nella nuova serie, inaugurata del 2001, ogni numero è diviso in due sezioni. La prima ("Forum") è incentrata attorno ad un tema unitario, un testo, un autore, un'idea della cultura antica greca o romana, e ospita un articolo base seguito da una discussione a più voci, o, in alternativa, gli atti di un convegno di particolare interesse. La seconda sezione ("Convivium") consiste in una serie di articoli di diversi autori relativi a specifici problemi posti dai documenti delle letterature classiche. Il Forum di ogni numero è dedicato, ad anni alterni, ad un tema greco o ad uno latino. In entrambe le sezioni la rivista, che intende essere fedele alla tradizione di rigore della migliore filologia classica, è sensibile alla riflessione teorica e metodologica più recente, ed è aperta alla ricerca interdisciplinare. I contributi presentati a «Aevum Antiquum» sono valutati, in forma anonima, da studiosi competenti per la specifica disciplina (double-blind peer review). The Atellan farce, a popular form of theatrical entertainment which originated from the Oscan town of Atella and was performed in Latin outside Campania, is generally referred to as a theatre of improvisation. Its comic character is based on the use of fixed characters and situations. In Pomponius’ and Novius’ plays, which have come down to us only in fragments, the tone is farcical and the action seems to fade into the grotesque: the speeches featuring in the fragments are often full of obscene double meanings. It would be useful to reconstruct the features of the stage space, the circumstances of the performance, and the principles of acting in order to better understand this form of drama. The fabula Atellana has its revival in the age of Sulla, when it draws much of its inspiration from the comoedia palliata. How does the tragic actor’s voice work in the theatrical space? This paper aims to focus on some episodes – narrated in the ancient sources – concerning the vocal performance. The article also considers linguistic aspects of dialects and generic constraints, as well as some well-known mistakes of pronunciation, vocal characterization of tragic main figures, and the shape of the trimeters they pronounce. Scholars have recognized in Aristophanes’ comedies a few passages written in prose: these are the traditional extra metrum sentences or interjections, prayers and loyal texts such as decrees (real or fictitious). A new analysis of these passages implies an evaluation of the prose’s layout in the manuscripts and a re-consideration of ancient or triclinian scholia. The ancient commentaries recognize verses composed with the aim to imitate prose. The actual metrical analysis of such passages shows a multishaped versification, so that the public loses the recurrency of well known verses, that is the characteristic attributed to the prose in comparison with poetry in ancient theory. Based on the analysis of Aristophanes’ plays and comic vases, this paper underlines the visual impact of the gestures performed in Old Comedy, especially in paratragic scenes. Then it sheds light on the language and the expressiveness of the comic body, which can lead to the temporary primacy of gestures over words. The reports on the artistic activities of two actors of the fourth century B.C. are analyzed in parallel. They are two contemporaries of Aristotle: the tragic interpreter Theodore of Athens and the comedian Parmenon, around which anecdotes flourished. They were two very experienced artists in the art of naturalistic mimesis. A mimesis that went even beyond the competition with reality: in fact, their perfect imitations had effects on the audience that the real experiences did not obtain because of the sensitive and emotional barriers (as also the Aristotelian reflection states). Both actors gave significant contributions to the evolution of the art of dramatic acting, in a century in which the actor becomes even more important than the poet. This paper would outline which delivery and gestures could be appropriate in Rome between first century BC and the first century AC to an orator who would arouse a smile in the audience or provoke laughter, now to gain the benevolence of the judges, now to ease the tension in the audience, or to discredit the counterparty in a process, turning laughter into mockery. The technical rhetorical precepts taken into consideration outline an ‘actio’ / delivery polite and moderate, never scurrilous, rough or coarse. The actor’s gesture, linked to the theatrical word, is also connected to the space where it is visible: the theatre. In Rome, the late Republican and Augustan theatres assume new architectonic and decorative characteristics and new ideological meanings, consequently they are different from the theaters where first Latin tragedies and comedies were staged. Through a selected archaeological and literary documentation, we propose an assessment of comic actors’ schemata in the new theaters built in Rome from the second quarter of the 1st century BC. While it is well known that Ovid’s Penelope repeatedly gives a distorted account of the ‘facts’ of the Odyssey, and of the Iliad as well, it has gone unnoticed her manipulation of the information she received from Nestor, through Telemachus, about the returns of the Greek leaders: in her account, the ‘Argolic leaders’ return home amongst festive sacrifices, and are welcomed by their spouses, who hang upon their lips and, during banquets, hear their stories about the Trojan war. She explicitly attributes these pieces of information to Nestor. In fact, in Od. III Nestor did inform Telemachus about the returns of the Greek leaders, but what he recounted was their ‘painful return’ (λυγρὸν… νόστον), and as far specifically Argolic leaders are concerned, he recounted the sad fate of Agamemnon, king of Argos, who returned home only to be killed by Aegisthus, the lover of his wife. Further detail about Agamemnon’s death is provided to Telemachus by Menelaus in Od. IV. The insistence of Ovid’s Penelope on the sacrifices celebrating the return of the Greek leaders reminds the reader of the importance of the theme of Agamemnon’s death as a sacrifice in the literary tradition (especially in Aeschylus’ Agamemnon), whereas the convivial setting of Penelope’s reverie recalls the fact that in Homer Agamemnon was killed by Aegisthus and Clytaemestra during a banquet (Od. IV 529-537, XI 405-434). Only few fragments of the prologue of Callimachus’ Aetia were known to Giovanni Pascoli, who, moreover, ignored their original context. On the contrary, he had a deep knowledge of Callimachus’ Hymns. The aim of this study is to analyze Callimachus’ Hymns’ influence on the Italian poet. It should be noted that Callimachus’ Hymns represent a reinterpretation of the Homeric poems, and that the Hellenistic poet wrote them «like a child, though the decades of my years are not few». In the prefaces to the individual books of the Silvae, Statius asks to be forgiven for the boldness of his compositions, which he claims to have been written in one go and very quickly. A comparison between these claims and rhetorical teaching, especially that of Quintilian, makes clear that the shortcomings for which Statius apologises should be identified with the arrangement of the topics rather than with the metrical and stylistic features of his verses. This paper analyses Lucian’s Dialogues of the Sea Gods 1 and 2 – both of them dealing with the myth of Polyphemus – under a double perspective: intertextual and intervisual. On the one hand, it clarifies the ways in which specific literary models are transposed into a dialogic form, according to a variety of adaptation strategies, ranging from nearly absolute fidelity (this is the case of DMar. 2, based on Od. IX 181-566) to a genuine ‘remake’ (DMar. 1, an adaptation of Theocr. 6 and 11, with a change in the situations and the points of view). On the other hand, it shows how Lucian, in constructing his Cyclops, appeals to the visual memory of his audience almost in the same way in which he urges their literary memory. This paper focuses on the choice and the use of some place-names in a section of Apollonius’ Argonautica book IV (ll. 323-1169). An accurate analysis shows that the poet, through subtle but clear linguistic and thematic associations and thanks to casual geographic homonymies and eponymies in the Adriatic region, intended to hint simultaneously at what can be defined as a parallel Attic itinerary. The first halt deals with Dionysus, Icarius and Erigone in a context clearly related to tragedy. Then, three other references lead to the hierà hodòs and finally to Eleusis. All of them are part of a complex architecture, that blends Hellenistic erudition (something that could sound like a bare list of geographic names to a modern reader) with a deep Dionysiac and Eleusisian mystic feeling. The indirect and complex way followed by the poet suggests, furthermore, that the Attic parallel scenery was not immediately comprehensible to the contemporaneous audience as a whole, but only to the readers who knew Athens and who were initiated to the Lesser and to the Greater Eleusinian Mysteries.